Single Sentence Review: Alert: Midi-chlorians no longer the worst thing to happen to sci-fi filmgoers. The movie opens with an inexplicably obfuscating voiceover by the alleged protagonist. Even very good actors like Nikki Amuka-Bird (Luther) and Sean Bean (Game of Thrones) are wasted on nonsensical dialog. The weak babbling protagonist is dragged from one set piece to another, making few decisions and taking even fewer actions. She’s kidnapped and rescued no less than four times. 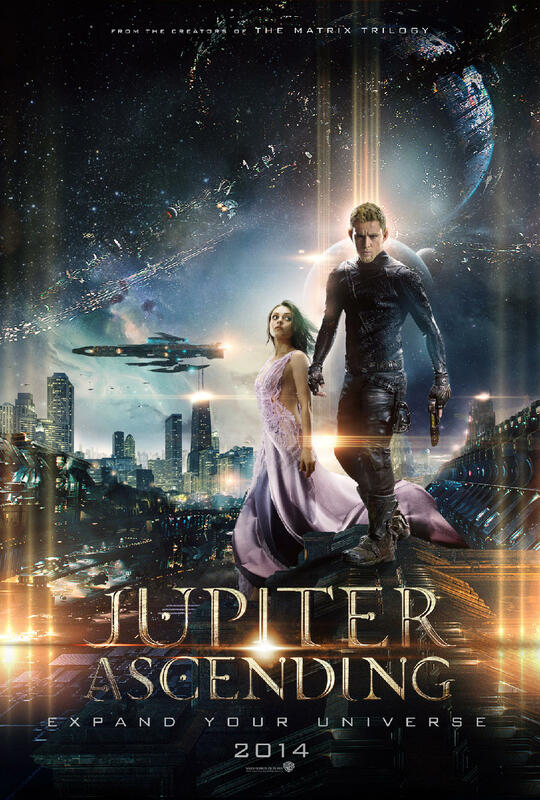 In Jupiter Ascending, humanity’s future is bleak. It turns out that we are even more greedy than we’d ever imagined. We can live for dozens of millennia by raising worlds of human crop and harvesting their lives to fill containers full of pimp juice that allow us to live forever. Each container is conveniently composed of the distilled essence of 100 humans. Earth is one such crop planet. Out in space, there are cat people. And dog people. And anthropomorphized dragon people. All there for the pleasure of our (well choreographed) hand to hand combat. And a group of Smeagol-gollums that can take any shape. And turn invisible. The film simultaneously manages to have the prettiest cinematic pictures seen in film this last blockbuster cycle and the most senseless plot. The senselessness even extends to the comic book technological antics. Jupiter Ascending is obsessed with gadgetry to the detriment of narrative filmmaking. Spaceships that transform and merge into one another without reason, with mechanical wings that act like hands and feet. These ships can fly underwater and open warp gates. Tatum’s mustachioed, eye-liner-rocking, love-sick rollerblader literally zips around on anti-gravity skates. With a magical shield that comes out of his forearm. As cheesy as all these elements are, they could have worked if seated at the grownup table with the accoutrements of plot, pacing and characterization. The only question almost worth caring about is whether Sean Bean lives through the film. Stars Mila Kunis (The Black Swan) and Channing Tatum (Magic Mike) seem to have had their absolute worst takes extracted from the director’s reel. Kunis is Dorothy: unappreciative of her life and dreaming of adventure. She has a forced marriage to a despot, is a constant plaything in a power struggle to become financial owner of Earth, and meets her handsome prince, who saves her over and over again. She’s also a princess. I just wanted to click my gravity boots three times and go home.